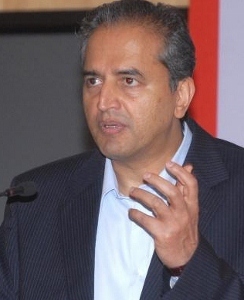 (CNS): Dr Devi Shetty has entered into partnership with one of the largest non-profit hospital chains in the United States in order to build and operate his proposed Cayman Islands healthcare city in East End. The renowned Indian heart surgeon who has proposed creating a facility based on his now famous low cost model has signed what was described as ‘document of public commitment’ with Ascension Healthcare Alliance. This deal will see the Ascension group handle purchasing, facilities management and biomedical engineering services at the new hospital, while Dr Shetty’s group will provide technical input and run the facility. The agreement between the two health care providers was signed at the Ritz-Carlton on Wednesday at a special ceremony with a full complement of government delegates, as well as Dr Shetty’s team and representatives from the US based hospital. Dr Tersigni from Ascension Health revealed that it has been in talks with Dr Shetty for two years to explore ways of using his model to cut health care costs in the US. The partnership would not only lead to the provision of state-of-the-art healthcare facilities for Cayman, he said, but would also act as a pilot test case for lower cost health care provisions and determine if Shetty’s model could reduce health care costs in America. Owing to the size of Ascension, which manages more than 17,000 beds across 1,400 hospitals, and Dr Shetty’s Narayana group, which has around 5,600 beds, the doctor said the partnership would increase the Cayman hospital’s purchasing and negotiating power to keep costs down. The Indian surgeon also said that the deal meant that the Cayman hospital would not have to advertise for a single medical job as there was enough manpower across the two groups to staff the new facility, even though there is a significant worldwide shortage of trained medical personnel. However, he emphasised that therewould be a push to begin training local people so that they could join what would eventually be a significant workforce as soon as was possible. Dr Shetty revealed that he still had plans to build a “healthcare city” here of some 2,000 beds but the first phase, which is scheduled to break-ground in August and on target to open early next year, will be 140 beds focusing on cardiac and cancer treatments. The goal is to offer local patients a way to receive tertiary treatment here in Cayman, which should result in a significant saving for the public purse, but also to create a medical tourism centre of excellence catering to sick people from the Caribbean and the United States. Speaking about the success of his model, Dr Shetty said the doctors at his hospital all receive a text message at noon everyday showing the previous day’s profit and loss, which helps them to manage costs, and he said the same principle would be applied at his health city in Cayman. Ambitious for his new facility and his first venture in the west, Shetty said he hoped that in a few years’ time when people thought of the Cayman Islands they would think of a medical centre of excellence. I never knew there were so many unhappy people in paradise! I would love to see the actual societal contributions that people who post here do for Cayman! My bet is nothing or next to nothing. You sit anonymously behind your computer at work on your boss’s dollar and b*tch and complain about everything under the sun. Newsflash this is a great project with tons or benefits for Cayman! You’re not unhappy about the project or any other! It’s your life! If you’re so unhappy change it! Smile mon your in paradise! "You sit anonymously behind your computer at work on your boss's dollar and b*tch and complain about everything under the sun." — Well done Anonymous, your b*tching and complaining about b*tching and complaining. Given that Dr. Shetty, as a great humanitarian is behind all this, I would also like to thank Shiva, Vishnu and Buddah. I think the majority has always realized that another hospital is a good thing. Moving the road on West Bay is a good idea as well and we need to lay down some lambs in order to get over this tuff time. Dump in Bodden Town…well…welll..that a hard on to swallow esp if Government is still going to be running it…maybe if it is turned over to a private company with liability for the site and modern tech then just maybe. A new port is needed as the current system is a joke. Move cargo from dock to industrial park to move it again. As a result the port operates a fleet of vehicles which is duplicate as the private company also operates. Still thinking about cruise facility….I just don't know but I say go cheap! We in Cayman have a way of doing business that strange. We spend huge amounts on signature projects and don't have any money left to floss our teeth. I say do it real cheap a wood dock if needed to get these tourist on island and forget about retail shopping plaza and the fireworks show every tuesday night. We can then spend some money on our airport instead. "I think the majority has.. " – I don't, but so what. I don't think you or I can speak for the majority. In fact, why even bother having a petition. Let's just ask you what the majority thinks and we will go by that. Save some money. Anyway, lets not lie to ourselves. The public never had a say in the matter. Ezzard actually said Shetty COULD NOT work here. He will have to eat those words. Regarding US doctors…the US hospital said they are joining up to LEARN from Shetty. The medical staff will come from the Narayana group no the US. Ascension is only dealing with some purchasing and logistics if you read carefully. Ezzard will be proved completely on the wrong side of this issue. But that does not surprise me. He does think he knows everything. This must not be allowed. Cayman has trained medical staff. every one of them should be offered the opportunity to apply for jobs at this Centre before a single member of Shetty or Ascensions exisiting staff be allowed to come here. Again we see Shetty is just putting his name to the deal with zero risk / money. Watch out – and can we make sure we agree no deferrals of Duty. Either we waive it or we collect it! Learn our lesson. Dont be silly…the phase one hospital needs probably 300 trained cardiac doctors and medical staff….where would you find them in Cayman??? The key phrase you are using is they CHOOSE to not work at the other two hospitals and so what is this project supposed to be held up while those who have choice decide whether or not they want to CHOOSE to work at this new facility? You have suddenly shed some partial light on Caymanian unemployment, some, NOT ALL bit some CHOOSE to be unemployed. I saw some guys sitting around Rock Hole, apparently with nothing to do. Maybe they need jobs? So you would take the personnel from the private hospital and the government hospital even though the majority are not trained in the types of services this facility will offer? Gee that is brilliant strategic thinking. How then would you staff the existing facilities that are still needed to handle routine medical care, not tertiary level care? Do you and the other naysayers not comprehend that this facility is not being built to handle births and basic surgery and illness requiring minimal hospitalization???? It’s for tertiary care,. I pray you never have to know what that means but what I can tell you is if I should ever have another heart attack I won’t have to wait 14 hours for the air ambulance to get me to the necessary skilled care I would need and needed in the past. Let’s hope you and others never have to experience what that is like. Go back to school so that you can know that you cannot dictate to an employer about who to hire or fire. Employers hire as they please and they share that authority with no one. On a serious note where will 100 nurses come from? We dont have them in Cayman I hope this is just a simple addition and not an y= f(x) calculation, that is so simple. If at all Michael Ryan is able to run the Ritz without having duty if this was demanded he would have built the facility in a better destination that the Ritz. Therefore cut the crap and tell Dr Shetty continue. Ascension is the largest Catholic non-profit healthcare organization in the U.S. Its primary goal is to provide quality medical services to low-income individuals at the lowest possible cost. It relies heavily on funding from Medicare and Medicaid in the U.S. While it is ranked high in the quality of care it provides, I wonder how it could possibly become a magnet for any type of tourism to Cayman. Cayman would do well to address it's own cardiac and related-obesity problems or are we just growing the next crop of patients for Shetty's harvest? The national level of fitness and health here in Cayman is shocking. For heaven's sake look at some of our leaders. I don't care who you are, you owe it to yourselves (and the rest of us who suffer with high insurance premiums because of your poor lifestyle choices) to get into some modicum of reasonable health. Heart attack, cancer and stroke, it ain't no joke. Put that on a t-shirt and sell it. Only in the Caymans can a Party blatantly breach fundamental terms and conditions of an Agreement, not put any significant skin into the game and still be welcomed with open arms. This indicates two things; 1: the Caymans are so desperate they will agree to anything, and 2: the current Administration is so far out of their league, as a result they are being easily lead into such inequitable agreements by much more advanced businessmen. Either way it does not bode well for continued stability of the Caymans. For the scores of residents who have never perused the MoU between Dr. Shetty and the CIG, I strongly urge you to do so NOW! This inequitable agreement in the absolute favour of Dr. Shetty will be fettering the Caymans for at least 100 years, thus being a drain on the economy to the tune of approximately One Billion United States Dollars over that period, with paltry, if any returns not even estimated to be near the aforementioned gargantuan figure for the CIG. Someone has to pay these bills, if its not Dr. Shetty I guess it will be the residents of the Caymans. Can the Caymans afford this on so many levels? Where are KPMG or some of the other top Accounting Firms on this very serious and concerning matter? Dr. Shetty is an absolutely brilliant businessman, probably more so than he is a doctor, and that says a great deal. Nevertheless, Dr. Shetty by his demand of his conditions, is confident the Caymans will have to implement various taxes in the very near future probably because of his project precipitating that call, yet he will be exempt from paying any form of new taxes for at least a quarter Century and import duties for not less than 100 years. Yet the capital outlay of the CIG to ready itself for such an agreement is mind blowing to say the least.i.e. new roads, new airport,additional Government services etc. Truthfully, the Governor (“H.E.”) has clearly and obviously dropped the ball on such far reaching matters, as a consequence it is not unreasonable to say that this project and its agreement (“MoU”) with CIG will not and cannot stand up to the scrutiny of the Framework for Fiscal Responsibility (“FFR”) called for by the U.K. recently. Or is it that the H.E. with his term extension been sent here to ensure that the UK’s repeated suggestion of implementation of various taxes is realized in this Offshore Tax Haven by maintaining idicator 2 mentioned in paragraph one? If you simply take a breather and really pay close attention to the facts and not rely on any of the rhetoric, I believe you will undoubtedly find the answers, which does not paint a chipper picture for the future of the Caymans. You should pay close attention to the facts too, this is THE CAYMAN ISLANDS and not "the Caymans"! Surely we can credit people with the intelligence to understand that the Caymans refers to the Cayman Islands. Is he allowed to refer to the Seychelles?, the Scillies? the Bahamas? the Orkneys? the Shetlands? the Falklands? the Galapagos? the Antilles? the Canaries? the Azores? Do you say “Uniteds” for the USA?? You have an arrogant attitude. You should respect the way it is pronounced by Caymanians. And it is not "the rest of the English speaking world" – only those countries whose nationals believe they are entitled to call us whatever they like. People in the Caribbean generally have no difficulty. Wouldn't it grate on your nerves if people continually mispronounced your own name? Would you think "I should be grateful that anyone thinks of me at all"? Fi real…this is “Cayman” or the “Cayman Islands”!!! Please stop with this The Caymans crap…that is Hollywood BS!!! Yes the Shetty deal with CIG does appear on the surface heavily in favour of the operation however it is merely used to bring a major, third leg to the economy. At least one other regional country actually promised Shetty to build the hospital FREE if he would come there due to the spin-off industries. This project will immediately inject into the economy Planning fees, building fees, company registration fees, import duty on construction materials, construction work, concrete sales and work permit fees. In the long term it will bring hundreds of thousands of new visitors here that will impact the taxis, hotels, construction industry, Cayman Airways, restaurants, rental cars, supermaket and more. And these visitors (family of patients and recovering patients) are here for a minimum of 2 weeks-twice the time of the average overnighter now. It will bring regional students to study here. So to consider 'losing' some taxes that we don't have, and would not have if Shetty was not here, is not the correct way of looking at this. This is the start of a new leg of the economy not unlike the first humble steps taken in the 1960s and 70s of our financial laws. Back then they thought we would pull a few banks from the Bahams as they went independent. Who would have guessed what that industry would have turned into. Given the fact that the financial Industry is under threat as you note, this is the a great move by the Cayman Islands. It is obvious that you have not read in detail the MoU in question! Furthermore, it is sad that you are one of those mislead lambs who rely on rhetoric and skewed third party information that is clearly misleading you here and more than likely with many other significant and far reaching matters as well. What you write in terms of Hotel room taxes and its associated fees and the like is pure and utter rubbish because Dr. Shetty will have his own “recovery unit” which is REQUIRED in any first class surgical procedure to mitigate infection and or be in close proximity in case of any adverse complications due to surgery. The fact is that these recovery units are cleverly outlined in Clause 1.2. i. and will be utilized for not less than ten recovery days (is that not two work weeks?! ), which is likened to a Condo thus negating any need for Hotels rooms for their patients and guests. If you are thinking, oh no they will use local hotels which are primarily along the SMB some forty-five minutes away by motorcar or maybe Mr. Gene Thompson’s own Time Share Royal Reef located in East End, I will reiterate, the first sentence of this paragraph, this possibility is near impossibly especially in the immediate days subsequent to major surgery. I know, gung-ho limited knowledge based fact advocates like you are going to say that the UDP Lowered Malpractice claims to a disappointing US$500,000.00 for the life of someone’s loved one, does not negate this operational procedure in a “first class medical facility”. Moreover, Dr. Shetty will not pay any fees and or taxes whatsoever, therefore no rooms taxes cannot be relied upon as in your conjecture. As in the operation of similar Medical Facilities, it is not unreasonable to say that “shuttles” will be dispatched to the Airport to welcome and bid adieu to their patients as well. Therefore the average Taxi drivers will not even benefit from this as well as in your argument. The approximate (and this is the high end of the scale) US $70 million estimated in up-front cost in terms of constructing the superstructure of now a 140 bed facility down from 200 beds over the course of the first five years is an extremely nominal amount when compared to not less than US 1 Billion estimated over the life of the project, that Cayman Islands Government (“CIG”) would have spent and or given up. If you are going to present arguments to fairly intelligent persons, Iurge you to please to do so with facts not just a third party understanding based on utterances of the ignorant and or the skewed perception of recipients of immediate financial gains to avoid misleading the general public. In addition, please furnish the name of “the other regional country that was going to build this hospital for free” and the associated dates this was presented to Dr. Shetty in order that those of us who try to look at the big picture can do so by seeking out these references. So we can conduct a comparative analysis, insofar as, was this other country going to build the “hospital” for free in exchange for Dr. Shetty paying subsequent fees and taxes immediately thereafter? If that was the case, I too would strongly urge the Government to offer a similar scenario and simply offer Dr. Shetty a favourable management and operational contract. Moreover, does this other country feature a tax scheme similar to the Cayman Islands? Or do they have payroll taxes, Corporate Taxes, Capital Gains Taxes, etc. and last but certainly not least, where are they located in terms of being less than an hour and a half from his primary market the United States of America? In closing, it is always befuddling how persons like you can simply throw your hands up into the air and make ignorant comments like what you have written condoning giving away all means of revenue for 100 years for approximately 7% of total value only being primarily spent over the course of the first five years is absolutely ludicrous to say the least. There is no wonder, a growing number of persons say that Caymanians are stupid! In life, there are NO FREE LUNCHES, someone has to pay, as was expressed in an earlier post, if not Dr. Shetty then it is clear it will be you, your child, and their grandchildren, and the residents of the Cayman Islands will HAVE TO! Can you say Hello Direct Taxes! But Dr. Shetty will not have to even say those words! Your diatribe seems to be filled with anger and has at least two simple problems in its theory that are fundamental. First off, Government is not actually "giving away' any taxes, fees or duties. If Shetty chose not to come here the government would have NOTHING to 'give away'. Concessions are not actually losses to the country because without them the money (development) would not come in the first place. The real costs in Shetty's MOU to the country from what I see is in supporting infrastructure (roads/airports/etc) but only if they are actually needed and phased. If they are needed then it means the hospital concept works and is bringing lots of people here and it means the country will have the funds to support it. If it does not work there will be no need for the spend. Secondly, with every patient that arrives here will be at least one family member. They cannot stay in the hospital. They will spend money in the Cayman Islands- one way or the other. The last time I followed a family member to Miami to get treatment I sure spent money there. Additionally, the staff all must find a place to live and eat. The doctors will look for good accomodation, cars, etc. I do not see any rebate in construction related costs either just medical equiment etc. In general, the import fees will increase significantly and associated industries will flourish. Just think about it for a while. I can bet that over the next year you will see project after project (not by Shetty) announced and spring up around that facility. buy land there now- it will triple by next year for sure. The UK Prime minister has in fact backed the Cayman project as well. (http://centos6-httpd22-php56-mysql55.installer.magneticone.com/o_belozerov/31115drupal622/health/2010/07/28/uk-prime-minster-backs-shetty’s-cayman-project). The UK would not do so if we were going to dig ourselves into a deeper financial hole- remember the FFR and the PMFL? A little less anger next time and open the mind, please. The Cayman Islands will benefit a lot more than it will cost us. That is clear. Scare me to see this ground breaking today – I agree no free lunch. These CIG politicians are so WAY out of their league!! This is just another Mike Ryan, Ritz Carlton, and others; with CIG further spending to accomodate these so called 'investors' and their bank accounts only. Just wait on all the medical waste generated from this Shettyville site, the GT dump will look like a playground. The patients and their families coming here will be making arrangements with the facility for accomodation, spending very little in Rock Hole for their stay and facility transportation. CI$ is way over most Americans head, I fail to see why they would now choose Cayman as a place for 'cheaper' medical treatment. And at least the UK and others have a bigger country for any foul ups and mistake, Cayman is so small and easily contaminated both the environment and population. Medical Tourism? Good luck! As a Caymanian who has had to endure the costs of heart care overseas and the horrible loneliness and isolation of being on an air ambulance, I am truly grateful for this facility. if I were a young Caymanian, I would be seeking education in ancillary care aspects of a hospital of this type and or training in hospital administration fields. Heck, I may still do so as this brings another viable pillar to our economy that does not hold us completely hostage to the financial services sector! Although it promises to be a great facility, I wonder how Dr. Shetty will keep it staffed. I do hope there is some kind of agreement to train and/or hire Caymanians, but I wonder…. Why the thumbs down? These are actual quotes from Dr. Shetty! Thank goodness at least one other Caymanian is grateful for this facility. I hope your heart is doing better. Really good news to see this progressing. For everyone complaining this is not progressing fast enough, this is a huge project which will take time. Don't have the patience to wait? Then you are not cut out to understand what it takes to build a hospital andshould instead stick to watching cartoons. we understand….. but after 3 years and countless missed deadlines this is still a 'soon comee' story……. Did no-one else read what was there? "The Indian surgeon also said that the deal meant that the Cayman hospital would not have to advertise for a single medical job as there was enough manpower across the two groups to staff the new facility, even though there is a significant worldwide shortage of trained medical personnel." "However, he emphasised that there would be a push to begin training local people so that they could join what would eventually be a significant workforce as soon as was possible." We've seen this scenario happen all too often; empty promises again. Another Ritz Carlton promise, to train. Train who? Employ who? When??? Could it be those willing to be trained? those willing to be employed? When? when they are properly trained would be a good time. How many local Caymanian doctors are out of work? Nurses? – NONE. If you think for one minute the hospital will employ unqualified labour to perform medical procedures just because they are caymanians, you are deluding yourself. Maybe you should go under the knife first and see what happens. Currently Cayman does not have a surplus of qualified medical practioners, be it doctors, nurses, and other specialists, therefore what the article is saying that a gap would need to be filled, and because of the agreement with their partner they should be able to cover this gap themselves. I thought this was quite simple to understand. I understand the medical school will actually start this september at UCCI which will be offering a BSc courses in health care. So they are training before they build. Get your resume out if you are interested. Again one must suspect that the only money being made on this deal is by the individuals making the deal. Everyone else is SOL. Caymanians, should'nt we be more concerned with our MLA bringing motions to the assembly, to make it mandatory to train our children, to take these jobs at the Hospital. It's time for the back benchers to show some sort of iterest in the wellfare of it's people, and stop plying politics with the people's lives.Lets hear what their plans are to get Caymanians into this field of work. a government mandating what career path you must take? i dont think you are really appreciating the disaster this would create. this sounds like the worlds of a dictator. maceewa da you? Yes we read the statement, the Indian made…whats the big deal? As far as im concerned we should now be getting our children prepared for these jobs. The hospital is coming, and all we are worried about is the politics. If we sit on our asses like we usually do, and not get prepared.. I dont blame the Idian for bringing in his own crew, to run his hosipital. 'his' hospital? on what basis. The Americans with cash and us with concessions are paying for this hospital. The only thing that will be Shetty's is the money he will take out. "the deal meant that the Cayman hospital would not have to advertise for a single medical job as there was enough manpower across the two groups to staff the new facility"
Sounds like NO locals will get any jobs! They were talking about the initial medical staff that needs to be in place next August!. I would not want to be operated on by someone that just walked off Elgin Avenue. This work takes years of education and practice before you can become competent. Even if that were true, which is almost entirely false, can you not understand the potential indirect benefits from the hospital to this country? 'almost entirely false'…? it is a quote! So are you saying Shetty is lying? Do you know of any Caymanians who are unemployed who are trained to work in a medical facility? – we all know none would want a janitorial job, even if they were trained for that. Smart people do smart things and end up with success. The Shetty-UDP deal sounds like a good thing. Time will tell. Let's hope for the best. Healthcare should be a right and not an option you can buy. It seems healthcare has become business instead of caring for your fellow sick humans. Unfortunately, that's the world in which we live. Cayman is not unique in this respect. I'm all for this! Well done and keep up the good work. I hope to see offshoots around this too. Our medical tourism could be a winner. I know Dr Tomlinson has talked about the possibilities with the Chamber of Commerce future of Cayman discussions. Just look at the fertility costs overseas. This is a nice place if you have to sit for three weeks doing a course of IVF and the average overseas cost is $25-000 -40,000 per treatment. What better place to get vitamin D from the sunshine and feel relaxed when trying to get preganant? We've been successful with this for our honymoomers for years! Let's expand this to other medical travel too – that we do not provide here: dental implants, fertility treatments, orthotic prosthetics, specialists who reside here instead of Miami? This is opportunity folks and we shouldembrace it. We may get healthier and learn a little in the process too. Honestly, I have never experienced such a negative bunch of people as those that post on this site. The reality is the US (and the world) is working through the greatest financial crisis in 80 years and despite that Cayman remains resiliant. On top of that, we have some tremendous foreign direct investment being made – Shetti facility, Dart's 20 year master plan and the Special Economic Zone – which could propel Cayman into the next century. Despite this, a certain vocal minority does nothing but moan and complain and look for clouds in the silver lining. Unbelievable. What you on about? This is good news…I guess that some people just can't be satisfied – what a sad life some must lead. Go back to the first announcement–nothing has changed–always 2000 bed and it was always a phased project as described. Not sure what "backtracking" you are talking of. With Ascension Health on board this is a huge deal for Cayman. I guess the 'nay-sayers' will remain quiet now.